We’re glad you’re enjoying our Knit Nights. It’s a great opportunity to escape your busy life and enjoy an evening knitting or crocheting with other local crafters. 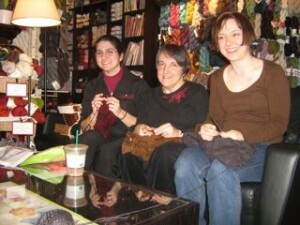 Such happy knitters, thanks Teresa! Knit a cute ‘lil leprechaun to celebrate your Irish heritage on St. Patrick’s Day (or not!). Patterns and photos are here and here. Or join an Irish Knit-A-Long. Click here for a funny cartoon. Betchya didn’t know that 2009 is the International Year of Natural Fibres. Look here for more info. And here’s a free pattern for a pair of beautiful Aran Gauntlets made with Aslan-Trends Guanaco. We have lots in stock. That’s enough fun stuff for today. Now back to resolving a few troublesome tax issues and other such boring details that must be resolved before launching our new online sales website. We plan to flip the switch later this week…. This entry was posted on Tuesday, March 3rd, 2009 at 11:45 am	and is filed under Uncategorized. You can follow any responses to this entry through the RSS 2.0 feed. Both comments and pings are currently closed.